I know a few people who did. They have videos of it on youtube. It's rediculous with the price and all. What are their videos of??? They won't get the pet code sent to them until August 12th...is it just a video of them actually buying the code??? Last edited by FroggyDoodle; 08-09-2011 at 09:40 PM..
Wow...and for us, Hallmark and Scholar's choice were the only places you could find them initially...although they are 'chain' stores, they are nothing like the big chains of Walmart and such. I think the whole limiting of pets is crazy. Ganz is ultimately losing money to the secondary market. People that don't play are buying the pets at stores at regular price...and are turning around and selling them on the secondary market for, pardon the pun, aMAZIN' MOOLAH. That money could be in Ganz pocket if they made more and didn't limit them. It makes you scratch your head at those working in the marketing offices for Ganz doesn't it? I did find one video on you tube...but look closely, people have 'copied' the Ganz Video. When these people's videos run their user name is ValerieVonScribe and they name their pet June. It is a 'scammer' who is wanting to get people to click a 'code generator'...which is some kind of virus and/or is a way they get your username, give you a code...and voila...they now have access to your account. Be VERY, VERY careful! Remember, NO ONE has actually received a Moon Bear code yet...so there can be none adopted unless they are a Ganz employee!!! DO NOT GET FOOLED! Last edited by FroggyDoodle; 08-09-2011 at 10:15 PM.. Here's my poem (since funstration is closed), enjoy! Love the bear, hope it's available for regular purchase at some point. Peace & Love! Really GANZ? This is nuts....don't you realize that thousands of people will spend $12.50 on this thing, but maybe 100 or less will spend $75.00! Not right, Ganz. I'm sorry, not right. 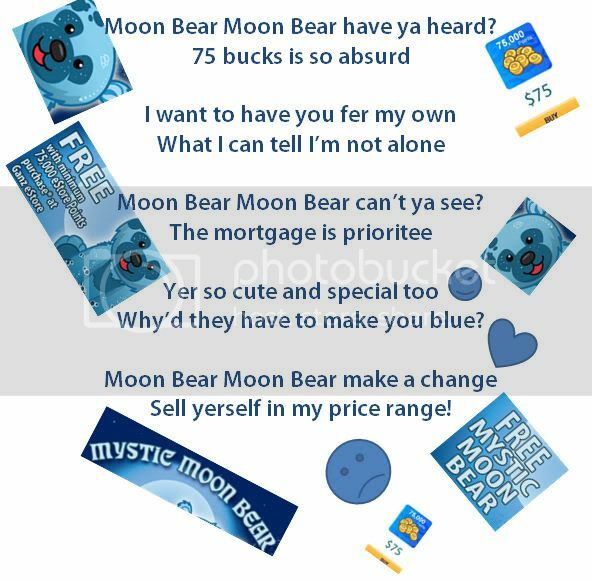 For those with facebook access, Ganz JUST posted on both the webkinz and ganz estore pages about their "SWEET" promotion of the Mystic Moon Bear. If you disagree that this is a sweet promotion, PLEASE take a minute to LET THEM HAVE IT! (P.S. Or to just ask them to reconsider and make this a purchase-able (i.e., $12.50) pet in the future. PS That poem above rocks! Nice job. Ooooh! Thanks. I didn't realize Ganz was on facebook. Hee hee hee. I have a feeling there facebook page is about to explode with posts from a lot of people. It already has been...as has their Twitter page.... .